During the Second World War the allies used various tricks and deceptions to fool the Nazi’s. One of these deceptions was quite elaborate and involved inflatable tanks, sound trucks and fake radio transmissions. This was known as the Ghost Army. 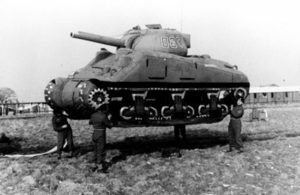 The purpose of the Ghost Army was to deceive and befuddle the Germany army in the weeks leading to the D-Day landings. The unit, known as the 23rd Headquarters Special Troops, put on a travelling road show throughout France.